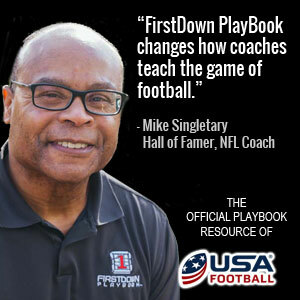 A youth football coach always needs to be thinking about the age of their players when it comes to scheme and the complexity of techniques that they try to teach. As we have been installing youth football slant defenses the last couple of weeks it has been a point of emphasis while working on the technique and coaching points. If you are coaching seven, eight or nine year olds it might be enough to just teach a simple “Rip” and “Liz” system that allows your linebackers to indicate which way the defensive linemen should stunt. After all, it can be helpful to just get the young players headed in the right direction, particularly if the offense is wearing you out to one particular side of the formation. However, as the players become more mature it is important to begin teaching them to read keys as they are slanting just like you would teach them to read a key in base defense. Now before some of you youth coaches think “Oh no. Here he goes again, getting way to complex for my young players” think about this for a moment. Reading a key or keys is simply coach speak for seeing what the offense is about to do to you. Even at the youth football level there are some very simple and basic blocking schemes that tell a defensive lineman everything they need to know as the ball is snapped. These simple keys are going to get the young player started to the ball and after that it’s the players job to go make a fundamentally sound tackle on the ball carrier. Today’s video sees us using our Visio drawing tool (soon to be replaced by the worlds best football drawing and editing tool) to detail four simple blocking schemes and how you can teach your youth football defensive linemen to recognize them as they are executing their slant technique. Get something to write with and on and let’s get started!